Ebay is the best place you can find a deal on perhaps the entire internet. Just what you're looking for might be lurking in a corner of Ebay waiting to be scooped up for just pennies! Finding a dirt cheap deal on Ebay isn't as hard as it sounds. Ebay even gives you some tools that you can use to your advantage to have updates sent to you automatically when certain items appear with your specifications. But the BEST way to find an auction ending at a really cheap price is to know how to search, and where to find deals. As a seller, Ebay is a learn-as-you-go experience. There might be times in the beginning where you don't know what you're doing, and wind up breaking even or losing money on an item. And this is where you, as a baragain hunter, will find some of the best deals! It's how Ebay works. There's that thrill of finding an item ending at such a cheap price that you're ecstatic over how much money you saved. Don't feel bad for a minute that you've found this deal, either. An auction is a binding contract by law, and the seller needs to fulfill it. So listen up, sellers! Don't start your items too cheap if you don't want them to end cheap, unless that's part of your marketing strategy. And now the fun part. How do you find these great deals? First, you'll probably want to stay away from Ebay Stores. All of the items there are buy-it-now purchases, and tend to have a much higher price than auctions. You'll want to start a normal search for the item that you're looking for, and see what the completed items are selling for. Let's say that I'm looking for something easy like a Yankee Candle brand candle. Using the advanced options icon next to the search bar, you can further refine your results, find listings from other countries, and ultimately, find that great deal on Ebay that you're looking for. This works really well for items that have more than one word in the title. We'll go back to our example about yankee candles. Almost 100% of the people looking for yankee candles on Ebay are going to type those two words into the search. Now, if you type in just the word "yankee," those "yankee candle" items will still show up in your search. Plus, you'll probably get a whole bunch of baseball items and t-shirts. Here's where it gets tricky. Refine your search further by selecting the category that most of these items are being listed in. In this case, it's the home and garden category. What if you omitted the word "candle" from your search, but still searched for "yankee" in the home and garden category? Once you've refined your search throught the advanced search feature, the number of items to scan through will have dropped drastically. You might find some irrelevent products in your search, such as in this case, results for Yankee Squirrel feeders, amongst other things. Refine it again by clicking on a category on the left. We'll choose "inside the home." These results pulled up less results, but results with "candles" in the plural sense were still showing up. So, I added the word "candles" also to be omitted in my advanced search. Now I've found 184 results, and only 4 pages to skim through. Right on the first page, I found a deal for 20 yankee tarts. The seller made the mistake of not putting the full title in the listing, so he's not getting the traffic he could have for the term "yankee candle." You can try this technique with any brand. Try it with designer handbags like "Dooney and Bourke," try it with "Lucky Brand" clothing, try it with any brand as long as it has two keywords in the brand name (or more). You can also try it with things like sports merchandise and use the word "sox" and eliminate "red." Some people just don't utilize the full title to their advantage, and this helps you! Another way to find deals, or rare items that aren't easy to get a hold on in the United States (or wherever you might live), is to search by country. Here, we've searched for Yankee Candles within the United Kingdom. While this term may not be the most profitable of items, imagine what other items you can find out of this country! How about items that you can resell? I bet you could find a bunch of interesting items in Australia or Germany that may not be worth much there, but aren't even available in the United States. That sounds like a great way to make some money and expand your product selection. 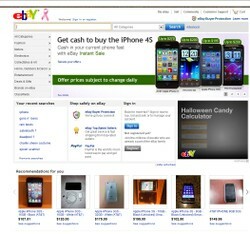 Now, go start your own search on Ebay and see what you can find! Want to Start Selling on Ebay Today? What's The Best Deal You've Ever Found on Ebay? An Auction Site Like Ebay?